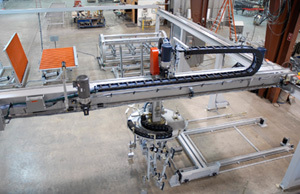 Automated Storage and Retrieval Systems from Creative Automation for Wood and Related Industries – Creative Automation, Inc.
Purpose-built Storage and Retrieval Systems are ideally suited for doors, countertops, laminated panels, etc. They work well for mass producing custom orders. 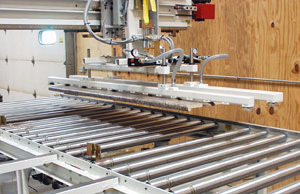 Overall view of door picking system that feeds multiple processing lines. 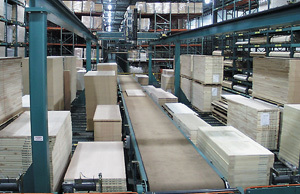 Partial stone storage and retrieval system prior to shipment. 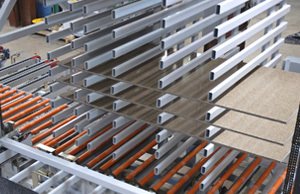 The 150 foot long system will have over 70 A-frame storage locations for stone sheets. Commands come from a server. 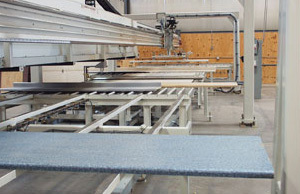 Countertops are taken from the main production line and stored. They are distributed to multiple finishing lines as needed. 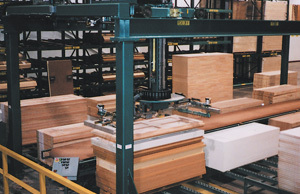 Closeup of countertop storage and retrieval carriage.